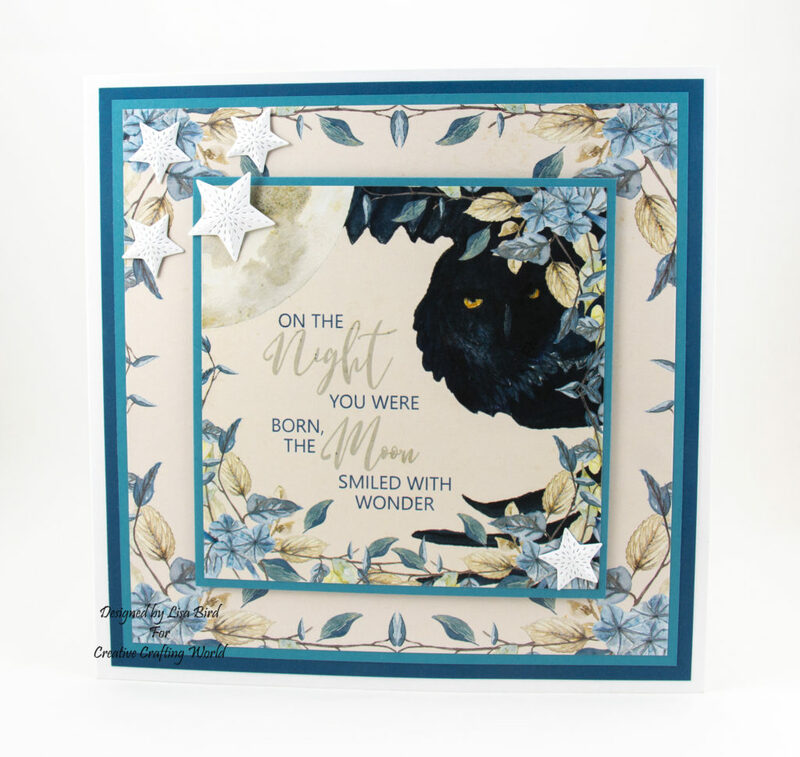 Today’s handmade card has been created using The Paper Boutique ‘The Moonlight Song’ paper collection and ‘Celestial’ die collection. These collections are from Creative Crafting World and will be first showing on Create and Craft at 4pm Tuesday 20th of November. Cut a square measuring 19.5 cms by 19.5 cms using dark blue card from the coloured card collection. Cut a square measuring 18.5 cms by 18.5 cms using blue card from the woodstock card collection. Matt and layer these together and attach to the front of the card base. Next choose a paper from the scene and sentiment pad and cut a matt layer measuring 13.5 cms by 13.5 cms using blue card from the woodstock card collection. Matt and layer together and using foam pads attach to the front of the card base. 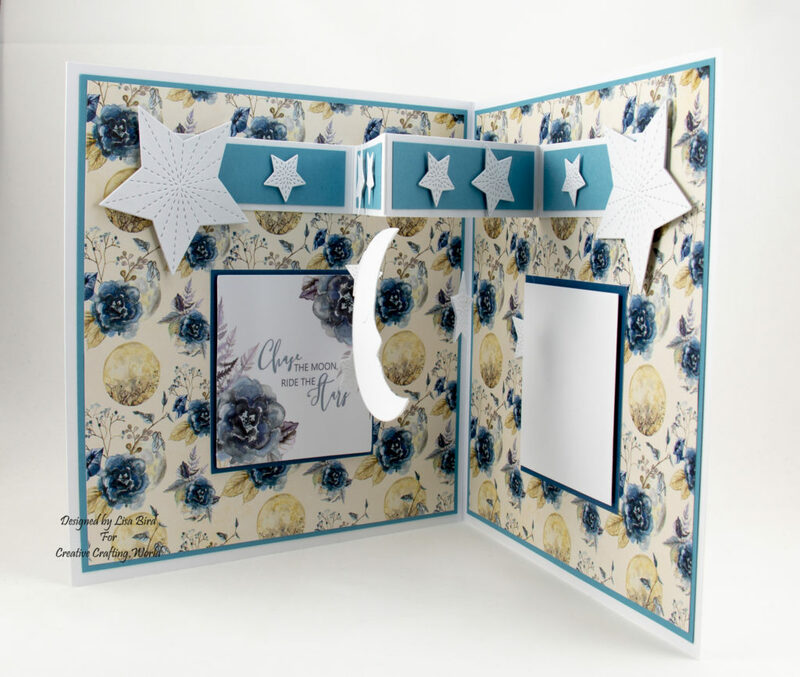 Cut out a few stars using the two small stars out of the celestial embellishment collection from white card. Fold the stars along the perforated lines to give the stars a less flat look. Attach to the card base using foam pads in the centre as this will let the stars keep their shape. Cut two squares measuring 19.5 cms by 19.5 cms using blue card from the woodstock card collection. Cut two squares measuring 19 cms by 19 cms from one of the papers from the 8″ by 8″ paper pad. Matt and layer together and attach each to the inside of the card base. Next cut two squares measuring 8.5 cms by 8.5 cms using the dark blue card from the coloured card collection. Matt and layer one to a square topper and attach to the inside of the card base on the left. Cut a square from white card measuring 8 cms by 8 cms. Matt and layer this to the other dark blue square and attach to the inside of the card base on the right. Next you need a piece of white card measuring 40 cms by 3 cms. To do this I cut 3 cms off another 8″ by 8″ card. Measure and score 10 cms from each end. 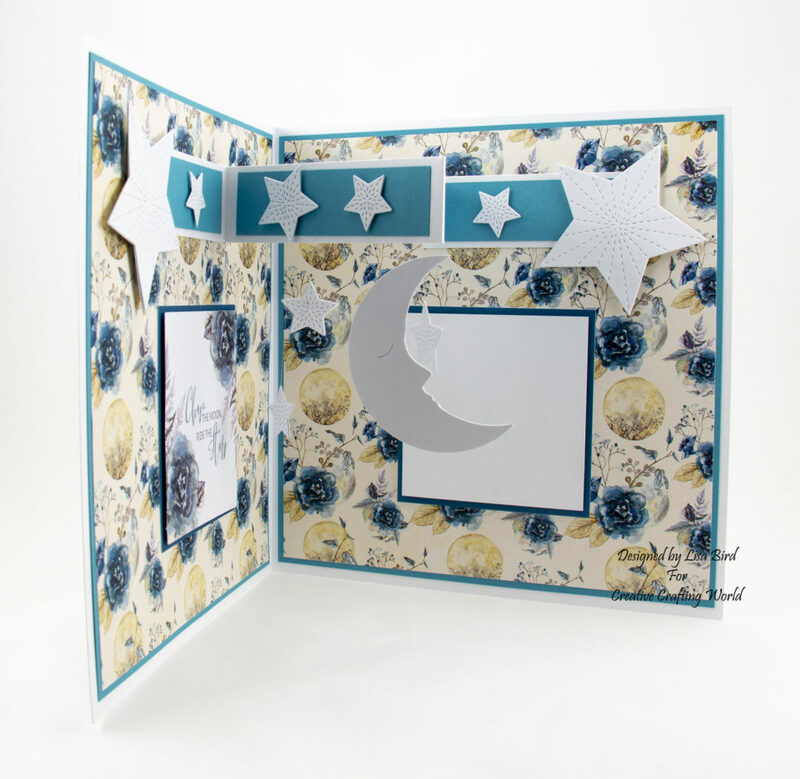 Using the celestial embellishment collection and white card cut out the moon and four stars. Using invisible thread attach the moon and four stars to the centre sections. Then using blue card from the woodstock card collection cut 4 pieces measuring 2.5 cms by 9 cms. Attach each piece between the scored sections. Attach each end to the inside of the card base at the top leaving the middle sections free. Next using white card cut out two larger stars and attach to the edges. Then using white card cut out the smaller stars and decorate the blue strip.